A senior police officer has challenged politicians to sort out the parades issue before someone is killed. Assistant Chief Constable Will Kerr was speaking after a second night of violence - believed to be mainly loyalist - in north Belfast. 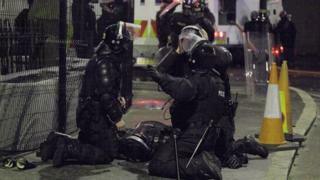 More than 60 police officers were injured and seven hospitalised. ACC Kerr said he feared someone would be killed unless the violence in the Carlisle Circus area stopped. 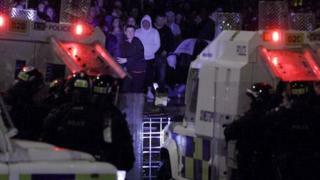 The outbreak of violence is a stark reminder that parts of Belfast are still heavily divided. The so-called peace walls - more than 40 of them - which keep Catholics and Protestants apart are a concrete monument to Northern Ireland's bitter history. The spark for the trouble in north Belfast was a parades dispute. The marching issue remains the biggest thorn in the side of the peace process. In the run-up to the loyalist Ulster Convenant parade on 29 September, he said: "Northern Ireland cannot afford an eleventh hour solution." On Monday night, petrol bombs, bricks, fireworks and stones were thrown at police. A van was hijacked and pushed into police lines. 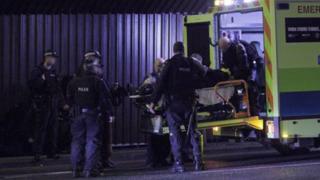 Two police officers were knocked unconscious by thrown missiles and another suffered a broken arm. ACC Kerr said he did not believe the violence was officially sanctioned by any loyalist paramilitary groups. But he said members of these groups had been involved in the trouble. "The community of north Belfast needs to see a resolution to this issue now," said ACC Kerr. "Collectively, we cannot afford to wait and we cannot have night after night of violence on our streets." He challenged politicians and community leaders to "sort this out, and sort it out now," ahead of the planned Covenant parade. On Monday, loyalists gathered in Denmark Street and republicans on the Antrim Road. Four water cannon were deployed by police. The area returned to calm at about 03:00 BST. Seven people were arrested, and ACC Kerr said there would be more to follow. On Sunday night, 47 police officers were injured during disturbances in the same area, following a republican parade. 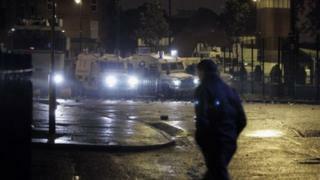 Police said up to 350 loyalists were involved in rioting. It has been claimed the loyalists were angry that the republican parade had no restrictions placed on it by the Parades Commission, which makes determinations on contentious marches in Northern Ireland. 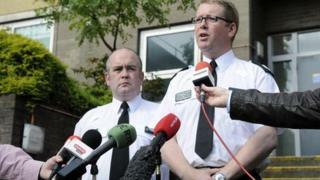 ACC Kerr said: "The huge impact on Northern Ireland cannot be ignored. "As we strive to promote our positive image, the negative effect of these violent pictures on jobs, tourism and investment cannot be underestimated. "We do not want to take a backward step. I urge all those with influence to urgently use it to bring a resolution to the violence and work towards a longer term solution for the issues affecting this area." 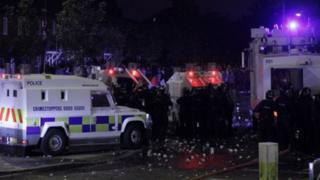 Alban Maginness of the nationalist SDLP told the BBC on Tuesday there was "nothing spontaneous" about the rioting. "The bulk of the violence over the past two days has, I believe, been sustained by loyalist paramilitaries," said the North Belfast assembly member. "I think this is an attempt to intimidate the lawful authorities." Winston Irvine, of the loyalist North and West Belfast Parades Forum, dismissed as "sheer rubbish" claims that the violence was orchestrated by paramilitaries. "The violence is unacceptable but it's also very understandable why people are so angry," he told the BBC. "This is a community backlash which has been building for some time." The chairman of the Northern Ireland Police Federation, Terry Spence, paid tribute to the officers on the front line. "Their bravery and courage is in stark contrast to that of the cowardly thugs responsible for trying to murder them," he said.